Haverford College, a little liberal arts school west of Philadelphia well be graduating and NBA player come mid-May. 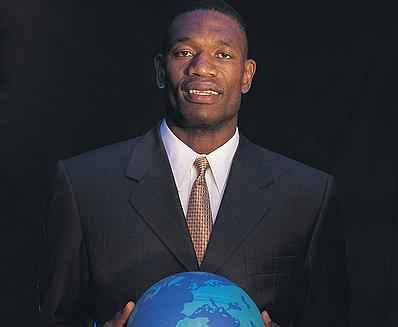 Dikembe Mutumbo will receive and honorary degree from the school and speak at it's commencement services. Due to his 18-year NBA career and his many ventures he's involved in he will not be allowed to suit up for the home hoop team however. Mutumbo is an excellent choice for Haverford. He speaks 17 languages (9 to be exact) and has many public efforts to support his native Congo so Dikembe fits the bill of what Haverford College seeks to accomplish. Haverford strives to be a college in which integrity, honesty, and concern for others are dominant forces. The College does not have as many formal rules or as much formal supervision as most other colleges; rather it offers an opportunity for students to govern their affairs and conduct themselves with respect and concern for others. Each student is expected to adhere to the Honor Code as it is adopted each year by the Students' Association. Haverford College, while a non-sectarian institution, has Quaker origins which inform many aspects of the life of the College. They help to make Haverford the special college that it is, where the excellence of its academic program is deepened by its spiritual, moral, and ethical dimensions. These show most clearly in the close relationship among members of the campus community, in the emphasis on integrity, in the interaction of the individual and the community, and in the College's concern for the uses to which its students put their expanding knowledge. That fits Mutumbo. Congrats on the honor Dike!